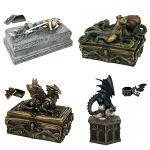 Here is a wide range of various boxes, bowls, chests, bags and other items to bind enchantments, spells or spirits to a vessel permanently or temporarily and to improve your life in a variety of ways. The broad-ranging Binding Boxes will create powerful connection points between you and anyone else. Other Spelled Boxes give you an easy way to communicate with spirits. Some can give you youth, energy, beauty, luck and other energies and spirits. The excellent handmade carved gemstone charging bowls and various bags have the same function. As previously reported, the spells can be bound permanently or temporarily. You can also find an excellent goblet and other great things in the list. The goblet will help you to create powerful potions. It has a powerful spell that provides the power you want to the liquid within the goblet – you just should follow the detached instructions. The listing is great, don’t miss any item. Surely, you’ll have the pleasure of just seeing each of the represented items. 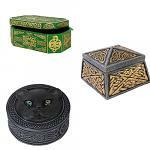 You can choose the box, chest, bag, bowl or vessel that will suit your style. All the items are very beautiful and they will definitely decorate the house (although you should remember about their energy and spells). Almost all the items are at a discount price. They should be seen as a necessary essential for every house as they help to find solutions and provide new life. You can get them for yourself or as a present. Don’t miss this offer, choose and buy right now! 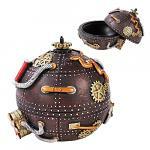 Our brand new Energy Spawn Conjuring Bag provides bursts of energy which you can spontaneously spawn and create various kinds of energy which you need in your life. It's fantastic when you need to summon a specific energy for your journey, magickal ritual or life. This bag conjures the power and energy of youth and will bind it to any vessel you place in the bag. Youthful energy can give you a burst of creativity, motivation, appreciation for life, discovery & exploration of self, and reaffirm the magnetically divine aspect of yourself that drives life. The binding you create will radiate with youthful energy which you can use in any way you wish through life that will last up to 14 days. This is wonderful if you want to put a new spring in your step, get yourself out of a rut, or embolden yourself with new energy. This binding is a complex piece of enchantment work that allows you to hunt down information, energy, magick, spirits, entities, etc through an extension binding that will reach into the 3 Realms and the dimensions within to find you what you are looking for. It creates an immediate, mystical & powerful connection between you and what you wish to hunt. The Universe is a vast place and the beings who live within are some of the most exciting creatures you will ever know. This box is a Gateway through which you can summon some of the most interesting & monstrous beings the Universe has ever known. This box can summon both spirits and living entities of White Arts or Dark Arts. The box is designed as a Gateway to some of the greatest beings in size, stature, and presence. 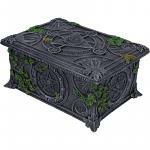 It is a box that holds a doorway to the gargantuan spirits and entities of the Universe in all her magnificent glory. When an offering is placed inside of this lovely, decorative dish, it activates the binding which brings the spirits of the Asudelaya. The Asudelaya was a secret organization of Sibyls who were the tellers of Greece, Italy, Egypt, and Sicily. They were the women who saw into the future through all means of mystic divination, and they were considered the very best, the very brightest, and the most divine of all who practiced. Over the years the Asudelaya had more than 200 women who served, with only 8-12 who were served at the same time. If you are a lover of the White Arts you will find yourself enamored with this Binding Box. You will receive random visits from White Arts spirits from the Spiritual Realm when you use this box. When you place any object in the box it will become a beacon of attraction for White Arts spirits who wish to visit you and interact with you. In this you will find incredible experiences that will show you just how exciting the world of White Arts can be! 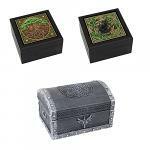 This vintage box is imbued with a powerful spell which shows you what you wish to see in life. The spell reveals visions & messages to you regarding your life. If you place a vessel within the box and place the box in direct moonlight, overnight, the vessel contained within will be imbued with the power of the box for 30 days. When you wear the vessel it will show you visions, provide you messages, give you signs, and show you things about your life; past, present, and future. Capture the power of the Moon's energy and have it enhance the powers and health of your spirits with this Miraculous Moon Box. Light Dancer magic box for achieving the supernatural goals of life. The amulets you create with the box will help you focus on your goals, achieve your deepest desires in magic, and follow the path you wish to follow for success in your life. This is a lively & energetic enchantment that will stand the test of time through your paranormal journey. The amulets you create will help you materialize the achievements that measure the most in your most immediate goals. 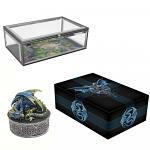 You will receive a Binding Box which allows you to capture any moment in time and store that moment in a vessel. You will place any object you wish to work with in the box and then you will bind that object with the specific memory of your choice. This is wonderful for making amulets to help you discover lost history, to explore ancient times, to expand your consciousness with a specific race of being, or to simply store your own memories that you wish to work with. You can capture a moment of time as a memory in the vessel and it can be from anywhere in the Universe and from any point in time. I call the spell on it Luna Bella, it's actually a blend of two, ancient Lunar Power spells; Roman Spell for Moon Power, Grecian Spell for Moon Energy Absorption. I then added my own spell which takes the energy & power absorbed through the box, and then transfers it to you, or another vessel! When it comes to Lunar work, Lunar spells, or conjurations during specific Lunar cycles, this tool is extremely handy for adding that extra, powerful, boost to your efforts! White Arts Binding Box that binds any vessel placed inside with spell blends of 4 different spells permanently or temporarily.